Storage: Store at or below -20 ºC. Solubility: Soluble in DMSO at 100 mg/mL; soluble in ethanol at 200 mg/mL; very poorly soluble in water; maximum solubility in plain water is estimated to be about 5-10 µM; buffers, serum, or other additives may increase or decrease the aqueous solubility. 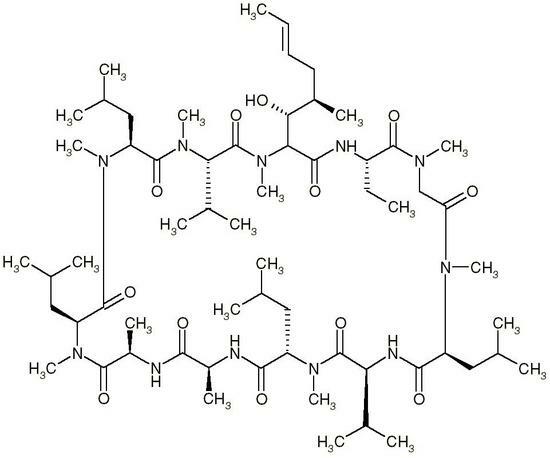 Disposal: A.
Cyclic hydrophobic oligopeptide isolated from the filamentous fungi, Tolypocladium inflatum, with potent immunosuppressant properties. Induces apoptosis in rat thymocytes and in murine B cell lymphoma cells, but prevents apoptosis in BLB cell lines induced by anti-IgM and ionomycin. Donjerkovic, D., et al. "Regulation of p27Kip1 accumulation in murine B-lymphoma cells: role of c-Myc and calcium." Cell. Growth Differ. 10: 695-704 (1999). Mordvinov, V.A., et al. "A human T-cell line with inducible production of interleukins 5 and 4. A model for studies of gene expression." J. Immunol. Methods 228: 163-168 (1999). Zaidan, E., et al. "Cyclosporin A-sensitive changes in mitochondrial glutathione are an early response to intrastiatal NMDA or forebrain ischemia in rats." J. Neurochem. 73: 2214-2217 (1999). Gottschalk, A.R., et al. "Identification of immunosuppressant-induced apoptosis in a murine B-cell line and its prevention by bcl-x but not bcl-2." Proc. Natl. Acad. Sci. USA 91: 7350-7354 (1994). The complex of cyclosporin A with the protein cyclophilin inhibits T-cell receptor signal transduction pathway via the inhibition of calcineurin (protein phosphatase 2B) with nanomolar affinity (Ki = 270 nM). Etzkorn, F.A., Chang, Z.Y., Stolz, L.A., Walsh, C.T. "Cyclophilin residues that affect noncompetitive inhibition of the protein serine phosphatase activity of calcineurin by the cyclophilin-cyclosporin A complex." Biochemistry 33: 2380-2388 (1994). Liu, J. "FK506 and ciclosporin: molecular probes for studying intracellular signal transduction." Trends Pharmacol. Sci. 14: 182-188 (1993). Inhibits interleukin-1α-, lipopolysaccharide-, and TNF-α-nitric oxide synthesis induction. Fast, D.J., et al. "Cyclosporin A inhibits nitric oxide production by L929 cells in response to tumor necrosis factor and interferon-gamma." J. Interferon Res. 13: 235-240 (1993). Marumo, T., et al. "Cyclosporin A inhibits nitric oxide synthase induction in vascular smooth muscle cells." Hypertension 25: 764-768 (1995). Hattori, Y., and Naranishi, N. "Effects of cyclosporin A and FK506 on nitric oxide and tetrahydrobiopterin synthesis in bacterial lipopolysaccharide-treated J774 macrophages." Cell Immunol. 165: 7-11 (1995).